The Royal Australian Mint celebrating 100 years of the Surf Lifesaver has released this special fine silver proof set. 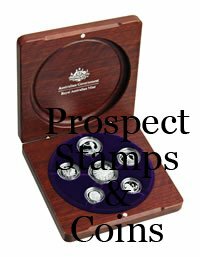 The collection of fine silver coins featuring spectacular images of Surf lifesaving on the $1 and 20c coin, the coins are a reflection of the life saver spirit finely crafted in 99.9% fine silver and hand finished to proof quality. This set serves as a fitting tribute to the men and women that patrol our beaches. The $1 reverse coin design depicts the spectacular image of team rescue, the 20c reverse coin design captures the image of a female surf lifesaver reeling a rope attached to the rescue buoy. This is a traditional image of surf lifesaving utilising a skill not now used.